Traditionally, a real estate salesperson joined a brokerage for the power of its marketing and name recognition, relying on the “higher power” to drive leads and sales. Changes to the commission split structure put more and more marketing responsibility on the individual. The shift to social media and enhanced online networking systems has dramatically lessened the power of the brokerage over the individual and now provides less and less value to the successful salesperson. 1. Changes that broke the brokerage model. There has been significant shifts in the real estate brokerage industry and none of the changes has been as significant as lower commission splits. Today the commission splits are ranging from as low as 95/5 to a couple of hundred dollars per transaction going to the brokerage. As you might imagine, with such low commission splits, a brokerage can survive only with a very high volume of sales. The margins of gross income and profitability is constantly dropping for the typical real estate brokerage. On one hand, there are not enough resources to properly manage and train the salespeople, and on the other hand the broker of record is constantly looking to generate more revenue to cover his overhead and expenses. Basically, most brokerages are operating “hand to mouth,” and a shock to their business, such as a couple of their top-producing salespeople leaving, can jeopardize their business. With the intention of protecting their business, brokerages are recruiting any licensed salesperson walking into their office. One of the main tools used by brokerages to attract real estate salespeople was and still is the promise to give them leads. The basis of that “promise” ranges from doing “duty time” at the office to online sources. In most brokerages, if not all, this promise is rarely kept. The brokerages cannot keep their promise either due to lack of resources to generate the leads or the number of leads generated is much lower than the number of salespeople. Further, even if brokerages provide leads, they are usually of very low quality, which salespeople consider a waste of their time to pursue. Moreover, the brokerages promise to provide “full coaching” and “hands-on training” for salespeople joining their brokerage. Again, due to a lack of resources, most brokerages cannot afford to provide the training required for their salespeople. As a result, most salespeople are not fully equipped to practice “properly” and “professionally” in the field. Additionally, most salespeople are not compensated for the cost of the technology they do use on a daily basis. With the increase in functionality of smartphones and tablets, the costs associated with the use of technology has shifted from the brokerage to the salesperson. Nowadays, there is another promise used as a recruiting tool to attract salespeople and that is online marketing and branding. It is very challenging to practically carry out this type of promise, as “online branding” is very “personalized.” In today’s age of “content marketing,” each individual salesperson has to be engaged with the online world and create their own individual brand and identity. This may involve writing blogs, posting videos, being active on social media, etc. … Practically, it is almost impossible for a brokerage to brand salespeople individually, as it needs a wide range of resources to accomplish this time-intensive task. So this most recent promise, along with previous ones, cannot be practically delivered even if brokerages had good intentions of carrying through. The lack of supervision, training and coaching has led to another phenomenon in our industry — a significant increase in part-time real estate salespeople. On one hand, these salespeople receive a big commission check, once in a while, which excites them to stay in the real estate industry, while on the other hand they are not confident enough to leave their full-time job for a long-term real estate career. Basically they are not dedicated enough to be fully focused on their real estate career or professional development. As a result, most real estate brokerages have become more of a babysitting and license-stacking office. Real estate salespeople are not fully invested into their career and therefore the rate of making errors or “unprofessional conduct” is high. The broker of record is constantly putting out fires that are created by salespeople, mostly by part-timers. Instead of having a long-term vision to properly train and manage salespeople, brokerages are busy handling issues created by their untrained salespeople. Unfortunately, the real estate brokerage industry has brought this upon themselves by constantly and continuously discounting their services. Conversely, despite receiving higher commission splits, the salespeople feel that they are not getting the level of services they expect from their brokerage, such as training, coaching, and, more importantly, their broker of record being a sounding board and offering support for their transactions. When salespeople do not perform well, they blame their brokerage for their lack of performance. This situation could lead to an environment of lack of confidence in the brokerage. As a result, salespeople are moving from brokerage to brokerage looking for those “promises” to be delivered. Salespeople who push forward to establish their own online brand often do not seek out the help of their brokerage other than to see what available tools they have access to. In fact, the traditional real estate brokerage franchise is not in a position to help the salesperson build their own individual online marketing plan, as each salesperson has their own unique characteristics and they can better create their own unique online footprint. In the past, brokerage and franchise branding might have provided some value to the image of individual salesperson, but in today’s online marketing world each individual is better off to create their own brand image independently. For this very reason, most salespeople do not see the value behind the concept of paying the so-called “monthly franchise fee,” and this issue is reflected in Inman’s most recent survey of independent brokers, published on Jan. 5, 2015. We are living in the age of “personalized marketing,” which means that the services delivered by each salesperson is much more important than the brokerage brand name they represent. Although personal branding has always been the biggest differentiator in the real estate sales industry, now it is the main “primary motivator” for the consumers of today. The expectation of today’s customers is “customized services” that align with their values, lifestyle and specific needs. There is no longer a “one-size-fits-all” strategy that built brokerages in decades past. 3. Consumers pay the price. Our primary mandate as professional salespeople is to protect the interest of our clients. I am not sure how we can serve our clients to the level of service that is expected when we have not received professional training and ongoing coaching. As mentioned earlier, consumers expect “personalized” and “individualized” services when they hire a real estate sales representative. I would like to remind my colleagues that 80 to 90 percent of successful real estate sales professionals’ business is based on repeat clientele and their referrals. You cannot expect to build your business if you don’t have a solid “fully satisfied” clientele base. 4. What is the solution? 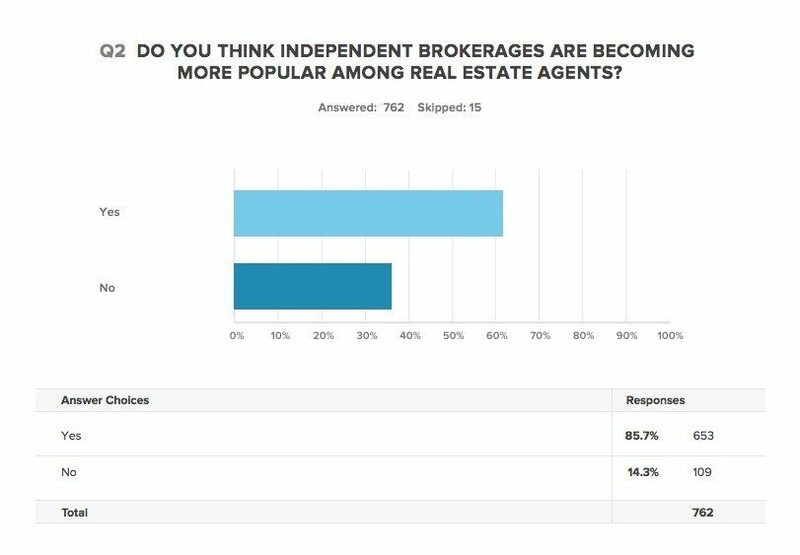 Our industry is no longer seeing much of any value in the traditional real estate brokerage franchise model, and, as a result, the opening of independent brokerages are the route more brokers are taking. Real estate professionals are rapidly moving toward establishing their own brokerages under their own name and creating their own brand. They prefer not be attached to the “traditional brokerage” image and, more importantly, want to take advantage of incorporating their real estate practice for tax saving strategies and taking charge of their own future. The real estate professionals who investigate the feasibility of opening their own brokerage very soon realize the overwhelming overhead cost and significant amount of time required to handle the administration of the brokerage office. Moreover, additional resources are necessary to meet RECO requirements and be up-to-date with changes in rules and regulations. Generally speaking, most of them are successful as salespeople, and they prefer to be out there selling properties and not stuck in an office to shuffle through papers and accounting reconciliations. Further, we can appreciate that a good salesperson is not necessarily a good administrator, a good bookkeeper or a good manager for that matter. For these very reasons, there are a high number of successful real estate salespeople who do not dare to open their own independent brokerage despite all its advantages. Reposted with permission from Realty Point; read the full white paper.